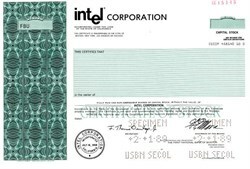 Beautifully engraved specimen certificate from the IOntel Corporation printed in 1989. This historic document was printed by the Security-Columbian United States Banknote Corporation and has an ornate border around it with a vignette of the Company's logo. This item has the printed signatures of the Company’s Chairman of the Board, and Secretary, and is over 24 years old. Intel, by far the world's #1 maker of chips, commands about four-fifths of the PC microprocessor market. Even though archrival AMD has eaten into that market share, and while some of its diversification efforts have stalled, Intel still makes several times as much from chips as do any of its rivals. Most computer makers use Intel processors; Dell is its largest customer (14% of sales). Intel also makes flash memories (it's #1 there, too) and chips for many networking and industrial applications. Faced with a stagnating PC market, Intel is focusing efforts on communications chips and foreign markets as it strives for future growth. Intel and its transfer agent, Computer- share Investor Services, said that as of August 1, 2005 – the date Delaware’s new law took effect – the company began issuing all new shares electronically through DRS. Shareholders who purchase Intel stock will receive a statement of electronic ownership rather than paper certificates that have to be placed in safekeeping. DTCC’s depository, which manages DRS for all markets, notified its bank and broker/dealer customers that the transfer of ownership on all Intel shares would result in the issuance of DRS statements, not paper certificates.